SNAFU! : ACV numbers will likely be NORTH of 700! ACV numbers will likely be NORTH of 700! Current activities follow recent approval of the consolidation plan by James Geurts, Assistant Secretary of the Navy for Research, Development and Acquisition and Navy Acquisition Executive. According to service representatives, the original ACV strategy had included a ‘pre-1.2 decision point’ to determine whether the service would continue with current design or develop a separate design focused on things like high water speed. They noted that primary service interest was in validating the water capabilities of the 1.1 design, with ‘the big difference between 1.1 and 1.2 being the requirement to be able to swim from ship to shore and back’. However, they quickly asserted that the desired swim capability has been proven out on the 1.1 design. While the purchase of 204 vehicles under the 1.1 programme is still in place, the US Marine Corps is now working to combine it with the second portion of the effort, which was originally referred to as ACV 1.2, into a single ACV programme. ‘Once the requirements community verified that we were where we need to be, we went to the acquisition authority to request permission to merge things into one programme’, sources told Shephard. The new terminology focuses on ‘ACVs’ and ‘mission role variants’. The initial focus is on the ‘personnel’ mission role variant with the first 204 vehicles being all personnel designs, as well as the next ‘400 plus’ in the consolidated programme. Additional mission role variants will be command and control, a weapons platform, and a recovery variant. 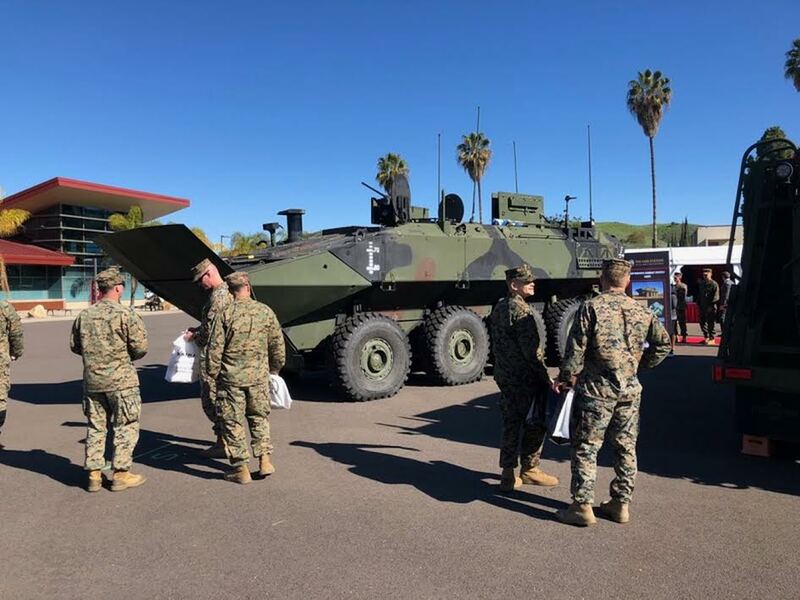 While potential designs for both command and control and weapons variants have been mocked up and displayed at the Modern Day Marine Expo aboard Marine Corps Base Quantico over the last two years, discussions surrounding an ACV recovery variant are still in the early stages. Sources close to the programme indicated that the service will soon release RfIs to help determine ‘the art of the possible’ for the other variants. Acknowledging that the mission role variants ‘will have an impact’ on overall acquisition numbers, they offered the likelihood that the planned total now stands ‘at the north side of 700 plus vehicles’. Meanwhile, the next step in the consolidation process will require the USMC to get approval from Congress to merge the two separate budget lines into a single line, most likely in FY20. That process is expected to take place in the next few months. We're inching toward a 1 for 1 replacement of the AAV. Interesting and something to make you lean back in your chair. Wheels vs Tracks. We've been told over and over that wheels have caught up, yet I still wonder. Time will tell but the Marine Corps is committed and the vehicle looks solid. Let's hope it works as advertised.